Are you sure you want to know? : Stop that train!!!! 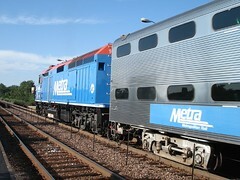 I live in Chicago, we have lots of public transportation options including the CTA bus, the CTA train, and the Metra commuter train. I live two blocks from one of the commuter train stops which conveniently drops me off right at the doorstep of my office - can you get more convenient than that? One of my inner joys is watching people run for the Commuter train, why? Because it doesn't have an as often schedule as the CTA and it's more likely that it will be an hour before the next train - unless it's rush hour when it's maybe every 15-30 minutes. The stop where my office is, is one of the busiest commuter train stops - like crazy busy - so there are always people who are "running late." To give you a lay of the land, the Metra stop is not at street level, you've got to climb about 25 steps or so to get to the platform and it's next to a major intersection, which means there's always people running late and lots of cars. I've seen people dart out into traffic, almost getting hit in the act, to get across the street and up those stairs. I've seen people a block away start running at full speed to get to the train sloshing coffee in their path to let everyone else have to walk through. I always find it comical because if they would have just left 5 minutes earlier they wouldn't be running, and oh yeah, the Metra schedule (at least on my train) is pretty spot-on, occassionally it may be early by a minute or late, but most times it's right on! So imagine my joy this morning when I actually brought the train to work. I had alighted from the train (the second second car mind you) walked the length of the platform and descended those stairs and was almost across the intersection when a man comes running across the street (against traffic) yelling "Hold the train! HOLD THE TRAIN!" I never understand why people yell at the train to wait, do they really think the train is going to wait, just for them? They must, otherwise why would they yell it. They feel so self-important that even though they're running late, the train had better damn well wait for them. Don't mind the dozens of other people who were able to successfully leave their house and navigate to the train platform ontime. Don't mind the dozens of stops prior to this one where people were able to successfully make it on the train. Don't mind any of that, because I can't manage my time and you had damn well better hold that train! Otherwise they'll write a strongly worded Yelp review that will explain just how mean you were for not holding the train. Guess what, they didn't hold the train, and I giggled inside!